He's stared down many a bandit (and the occasional orangutan), but to my knowledge, Clint Eastwood never faced off against aliens, ghosts and lizard men hurling barrels of dynamite at him. Still, this would have been interesting to watch—and the idea of it makes for a great game for the iPhone or iPod touch. Welcome to Billy Frontier, a cool, tongue-in-cheek western game developed and published by long-time Mac game developers Pangea Software. Cowboys and... Aliens? : Pangea Software turns the classic western on its ear in Billy Frontier. Where the classic westerns left off, Billy Frontier picks up, with players donning their own tin star in order to drive the bad guys out of town. To complete the game, players must complete six levels featuring three events: two shootouts, two duels and two stampedes—each filled with alien baddies, ample gunfire and hopping kangaroo-bovine mutations known as “kanga-cows”). The graphics and sound make this game and Billy Frontier flexes its muscles with a 3-D engine that shows the player what the iPhone and iPod touch are truly capable of. Tap into one of the game’s target practice levels, and the cavalcade of lovingly rendered kanga-cows, aliens, lizard men, ghosts, bottles, ammo boxes and power-ups that vault into the air as targets will amaze you. This, combined with a fun, twangy, well-crafted soundtrack, creates a terrific game environment the player can enjoy for a few minutes at a time as well as during longer gaming sessions. Unfortunately, gameplay within Billy Frontier fluctuates between extremely fun and downright frustrating depending on the situation. 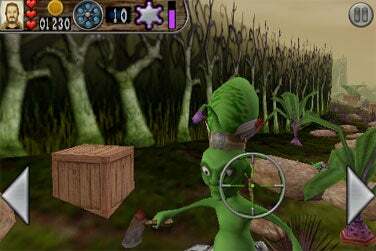 During shootout levels, the player taps the screen to indicate where they want to fire at aliens the ducking for cover (and occasionally taking potshots at you). As the gunfight continues, players can shoot barrels and crates to reveal extra ammo, health, and money which must shot again in order to be collected. Sadly, the game’s targeting system feels disjointed and players may find themselves spending half their ammo trying to pick off an alien or, worse, trying to collect more ammo to continue the level and stay alive. (If you run out of bullets, you die). 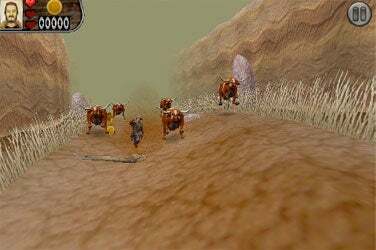 Don’t Have a Cow, Man: Billy Frontier’s stampede level makes use of the accelerometer to outrun a herd of kanga-cows. The duel levels are challenging but entertaining; players must tap symbols to match displayed sequences while showdown-style cinematics and camera angles lend to the environment). The stampede levels make the most of the handset’s built-in technologies. Here, players must try to outrun a herd of kanga-cows while jumping over rocks, fences, and fallen trees along the way. The use of the accelerometer allows players to accurately tilt the unit to steer Billy down the path while collecting coins and chili peppers to act as speed boosts. Stampedes prove to be a refreshing break from the constant gunplay. Even with its flaws, Billy Frontier raises the bar for graphics and sound found on an iPhone game. It may not be perfect, but it’s off to a great start, worth the $8 standard price. (As this review was posted, the App Store lists Billy Frontier and other Pangea Games at $1—a definite bargain.) Billy Frontier is perhaps just a few updates away from being truly terrific. Billy Frontier runs on both the iPhone and the iPod touch running the iPhone 2.2 software update.